To order a printed copy of the Explore Cycling Holidays brochure, simply click the Request button below. Incredible Cycling Holidays For Every Ability! Explore Cycling Holidays invite you to experience a fun-filled, life-changing holiday with a difference. Order the brochure today to start your journey here! Whether you're an avid cyclist or just prefer a gentle ride at the weekend, Explore Cycling Holidays has the perfect trip just for you. Riding on back roads and rural tracks, you can enjoy the pure beauty of your surroundings in its full entirety. You can bring your own bike but Explore will include bike hire in your package and you can even hire e-bikes as an optional extra. Whatever you need, the experts at Explore Cycle Holidays have you covered- all you have to do is order their brochure today! Unleash the adventurer inside you and travel to beautiful countries such as Spain, Portugal, Morocco and Germany. 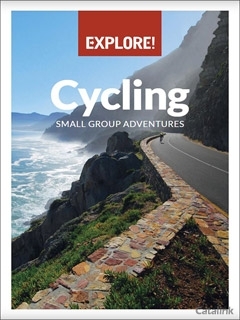 Order the Explore Cycling Holidays Brochure today for inspiration on the trip of your lifetime! By pressing the Request Printed Brochure button you give consent to Explore Cycling Holidays (and their Data Processors for the specific purpose of delivering your literature) to send you their Brochure .